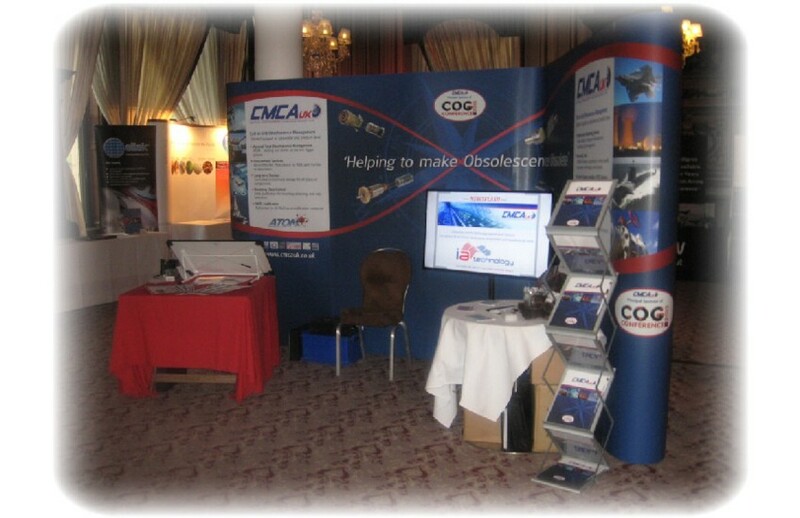 My presence at an exhibition is a great way to help ‘draw’ customers to your company’s stand. Due to the nature of my profession, visitors have a natural curiosity when they see me working and cannot resist the urge to investigate. This inevitably results in the visitor engaging with me and the company I’m representing. Everyone loves a freebie and the drawing only take a matter of minutes to complete. Thanks to my digital camera, the way in which I work is unobtrusive. I simply take a quick photo of the client and complete the drawing whilst the firm’s representatives conduct their sales pitch. Even if I have a queue of clients awaiting drawings I just add more to the list and give both parties a rough idea as to when the drawing will be ready ensuring their return. Alternatively I can arrange to post the drawing to them free of charge. I am readily available any time of the day or week and I’m happy to travel to virtually any location. My no-obligation quotes will comprise all the drawings I complete as I only charge for my time. Contracts can be drawn up which book my services for just a few hours or for several months. Where necessary, I will include fees for any travel and accommodation expenses. One of the most exciting and unique aspects of booking my services is the option to have a company theme drawn based around your company’s service or product. I will provide you with a preliminary sketch which will incorporate key aspects of your firm along with your company details (e.g. phone number, e-mail, website etc.). You will only require a minimum of two themes (one for each gender) although you can request more if needed. 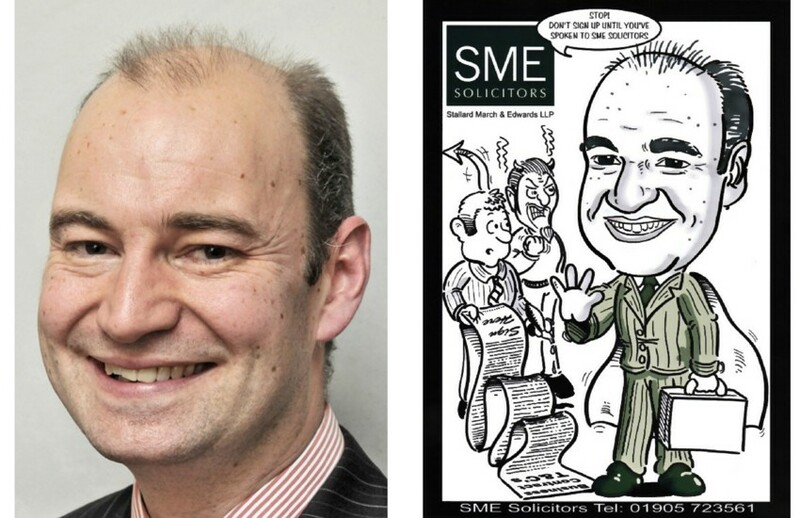 I then bring copies of these along to the event which will be used to accompany the caricatures. I am happy to provide these themes free of charge if the bookings take place over several days but please contact me with the details beforehand. The bookings I have taken in the last few years have been varied. I cater for all types of companies and contracts. Below are a few events I have attended in recent years with detailed information as to how each project came about and my role in the proceedings. One of the employees had a caricature from me and pitched the idea to her bosses to have me attend an event in York. They decided to book me for 2 of the 3 days and paid for overnight accommodation. This booking is a perfect example of how my method of working benefits certain events. Their clients were attending seminars throughout the day and were only in the vicinity of the stand for approximately 30 minutes between lectures. This meant I could take their photos and draw the caricatures whilst they were away resulting in a much higher work rate for me. I designed the company’s own theme to illustrate the services of the firm. A promotions firm contacted me to attend a large scale outdoor motoring event on behalf of their client. 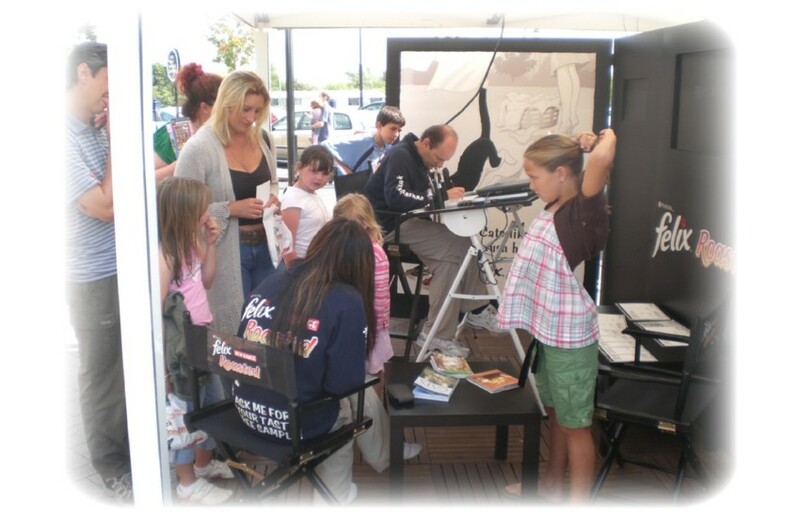 I was based in a port-a-cabin with another cartoonist where we were required to draw visitors to the company’s stand in their chosen Nissan car model. These were then scanned in and used on Nissan’s website. I was booked on 3 separate occasions for Toyota through the Sales room manager. 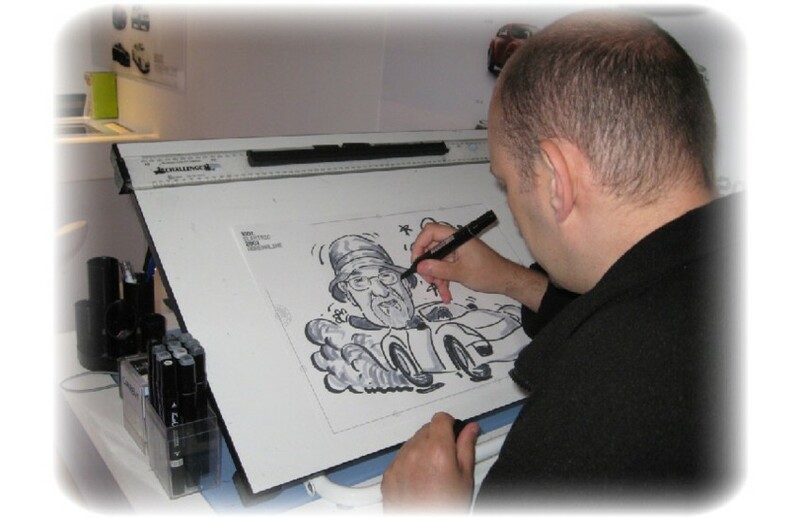 At each booking I was required to draw caricatures of their customers when they came to collect their new car. 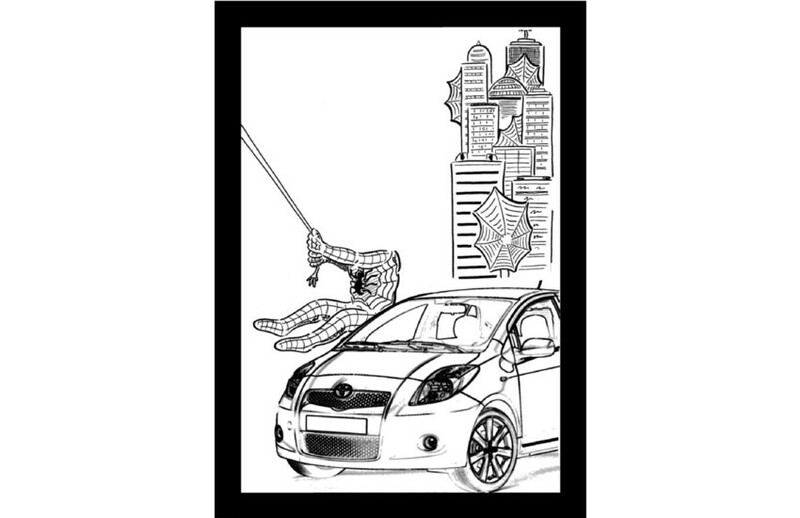 I drew the themes beforehand which included an image of the customers car model (e.g. Yaris, Aventis etc.) and I left the number plate blank so that I could add it in on the day. 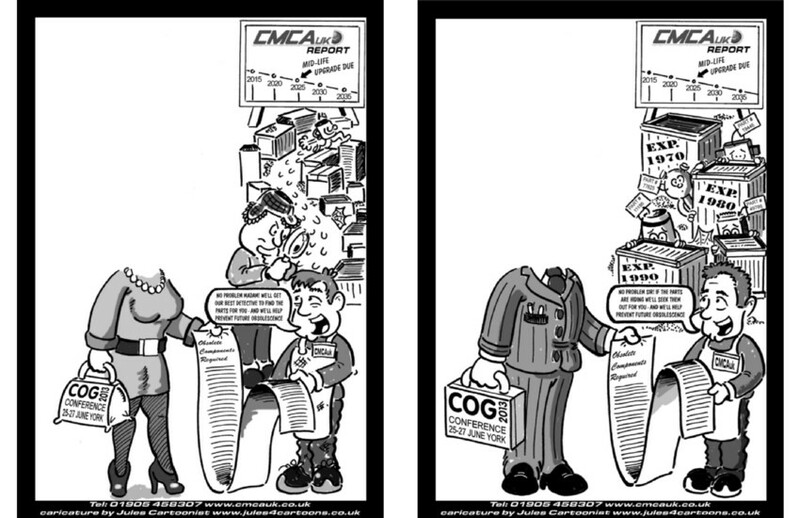 The LCD on my camera was again very useful as it allowed me to secretly draw the caricature in their office whilst the sales person dealt with the paperwork. By the time the customer was ready to drive away, their drawing was ready. Initially I was approached by the promotion firm and asked if I could draw animals. I was then invited to London to discuss the project with their client and was given further details. Initially I was invited to help launch the event at the company’s manufacturing plant. I went on to work 4 days a week (Thursday - Sunday) over a 12 week period in numerous supermarket car-parks throughout the British Isles. I was accompanied by an event manager for the entire time together with a variety of promotional men and women. My role was to draw the cats of the customers that approached the Felix gazebo where I was stationed with my drawing board. The patrons could supply me with photos of their feline friends or they could choose a breed from a book. The drawing board, materials, pens and uniform were all supplied to me and I was given accommodation, petrol and lunch expenses together with a predetermined daily rate.